Q79. 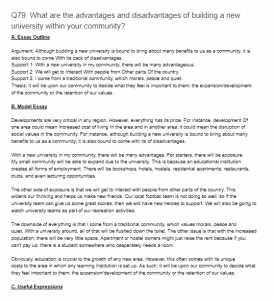 What are the advantages and disadvantages of building a new university within your community? Argument: Although budding a new university is bound to bring about many benefits to us as a community, it is also bound to come With its pack of disadvantages. Support 1: With a new university in my community, there will be many advantageous. Support 2: We will get to Interact With people from Other parts Of the country. Support 3: I come from a traditional community, which morals, peace and quiet. Thesis: It will be upon our community to decide what they feel is important to them; the expansion/development of the community or the retention of our values. Developments are very critical in any region. However, everything has its price. For instance, development Of one area could mean Increased cost of living In the area and in another area, it could mean the disruption of social values in the community. For instance, although building a new university is bound to bring about many benefits to us as a community, it is also bound to come with its of disadvantages. With a new university in my community, there will be many advantages. For starters, there will be exposure. My small community will be able to expand due to the university. This is because an educational institution creates all forms of employment. There will be bookshops, hotels, hostels, residential apartments, restaurants, clubs, and even lecturing opportunities. The other side of exposure is that we will get to interact with people from other parts of the country. Thiswidens our thinking and helps us make new friends. Our local football team is not doing so well, so if the university team can give us some great scores, then we wdl have new heroes to support. We will also be going to watch university teams as part of our recreation activities. The downside of everything is that I come from a traditional community, which values morals, peace and quiet. With a university around, all of that will be flushed down the toilet. The other issue is that with the increased population, there will be very little space. Apartment or hostel owners might just raise the rent because if you can’t pay up, there is a student somewhere who desperately needs a room. Obviously, education is crucial to the growth of any new area. However, this often comes with its unique costs to the area in which any learning Institution is set up. As such, it will be upon our community to decide what they feel important to them; the expansion/development of the community or the retention of our values.